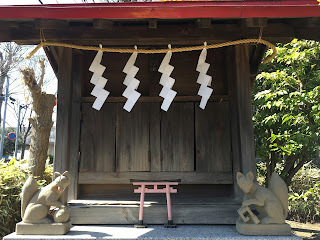 This is a small neighbourhood Shinto shrine to the Goddess Inari, one of the main kami of Shinto. Being the Goddess of general prosperity and success (as well as foxes) there are thousands of such shrines, big and small, all over Japan (the head shrine is Fushimi Inari in Kyoto). The altar is flanked by a pair of (very stylised) foxes, said to be the messengers of the Goddess. A male/female pair, the one on the left has its paw atop a jewel (tama or 玉） said to represent the power of departed souls while the one on the right has a key (kagi or 鍵) supposed to draw out or unlock this power. These foxes are found not only at shrines; for example, there are also a pair of foxes at the base of the statue shown in a previous post (blown up below) but interestingly the pair are reversed. You might find offerings on the altar, including inari-zushi (稲荷寿司） which is typically vinegared rice completely wrapped in a thin layer of fried tofu. It is a popular offering because of the (unfounded) belief that it is a favourite food of foxes! Colloquially, it is sometimes referred to as oinari, the honorific o showing respect. 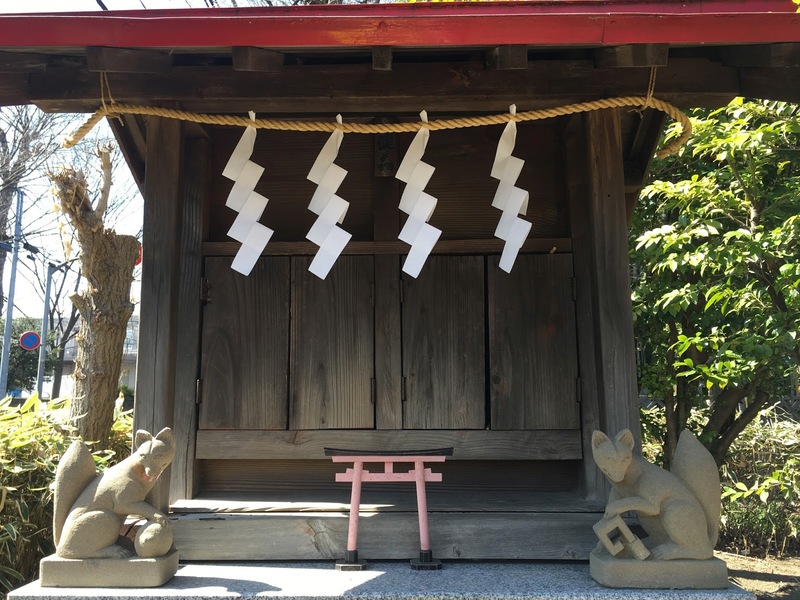 Look out for the foxes, not only at shrines but at the roadside, in buildings, and even in Buddhist temples, reflecting the fact that religion in Japan is pluralistic and most Japanese are multi-faith.